Remembering Brad Williams: A Heart That Twinkled, represents another “first” for BIMP, being the first retrospective honoring the work of a former student of the Puppet Arts Program. Bradford Cody Williams, who died in 1993, was a graduate student in the program at the University of Connecticut between 1975 and 1980. 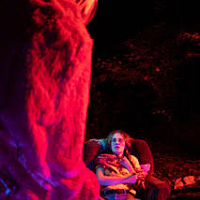 He attended Hope College in Holland, Michigan, as an undergraduate, where he met and worked with Burr Tillstrom who encouraged him to pursue a life in puppetry. Brad’s creativity flourished and his imagination and whimsy delighted all whom he met. First Lady Barbara Bush toured the country with the puppets “Rex” and “Rita Readasaurus,” which Brad designed for the American Literacy Program. 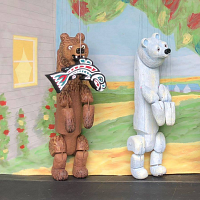 Brad also developed puppets, graphics, scenery, and acted for the first Pinwheel, which was part of the inaugural programming for the Nickelodeon channel. He was a master calligrapher and logo designer. Nancy Laverick, director of the 1989 Puppeteers of America Festival (held at M.I.T. in Cambridge, MA) engaged him to design the festival logo. The results: a traditional Mr. Punch being manipulated by a space age robot. 20 years of exquisite productivity, this artist has had a lasting effect upon his colleagues in the field of puppetry. 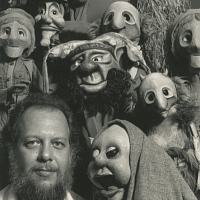 Brad’s early work includes Punch and Judy shows that performed in Michigan in 1975 and continued his work through 1993 when he designed the poster for the Hope College Theater subscription series. He died before seeing the final printed version of the poster. 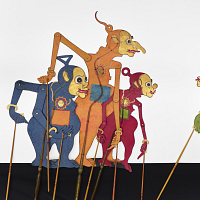 Over 180 pieces which included puppets, masks, and scenery pieces in addition to scores of examples of his calligraphy were viewed at BIMP’s exhibit in his honor. Biographical notes and descriptive quotes from friends and fellow puppeteers enhanced the viewer’s appreciation of this talented artist. The opening of the exhibit was made special by the attendance of Brad’s parents, Bob and Pat Williams; his sister and brother-in-law, Ken and Lorma Freestone with their children; and Judyth Thomas, Director of Publicity for Hope College Theater. The family, which traveled from Holland, Michigan for this event, brought “Zabar”, the hand and rod puppet that was Brad’s alter ego. “Zabar’ has an extensive wardrobe–including a tuxedo and, of course, his space suit–but in a special nod of recognition to his creator, he chose to go on display wearing his Hawaiian shirt and a necklace made of miniature pizza slices. Hawaiian shirts were favored apparel for Brad. Based on this exhibit, current Puppet Arts Director Bart. P. Roccoberton, Jr. was able to arrange the completion of Brad’s MFA degree, posthumously.